Presenter View is a secret view that’s only for you! It’s a way of seeing your notes and upcoming slides while your audience sees only the current slide as usual. Here’s what Presenter View looks like. What can you do with Presenter View? You can click any slide to go to it immediately. At the bottom of the Notes pane, you can use the Zoom In and Zoom Out buttons to get the notes text just the size you want, so it’s easily readable. Beneath the slide is a timer that keeps you on track. Beneath the slide, you have easy access to both forward and back arrows. You can also access pen and pointer features by clicking the Pointer Options button below the slide. Beneath the slide, at the left, you see your current slide and the total number of slides. How do you set up Presenter View? The computer must have multiple monitor capability. I’ve never seen a laptop that didn’t, but many desktop computers require two video cards. You need to enable multiple monitor support by setting the display options. This is a Windows function and varies with your version of Windows. Try going to the Control Panel and clicking the Display icon or right-clicking the desktop and choosing one of the options; on my Windows 7 laptop, I can choose Graphic Options> Output To, and then choose one of the options. Most laptops also have an F key that sets this up. For example, you might press the Fn key and the F5 key together. Go into PowerPoint and click the Slide Show tab. Check the Use Presenter View check box. (In PowerPoint 2003, choose Slide Show< Set Up Show and check the Show Presenter View check box.) Then go into Slide Show view by clicking the Slide Show view icon at the bottom of your screen or pressing F5 (to go to the 1st slide) or Shift+F5 (to go to the currently displayed slide). The problem is, this may not work! The check box may be grayed out or you may get a message saying that you need two monitors. That’s because Presenter View is designed to be used with your computer plus a projector. But wait! What if you don’t have a second monitor? Presenter View is a great tool for presenting, but it’s also excellent for practicing. By the time you are ready to present, if you practice enough, you may not need your notes, but you’ll certainly need them for practicing. The problem is that you usually don’t have a projector with you when you’re practicing (although practicing with a projector is a great idea). Now, go to your presentation and check that User Presenter View check box. Go into Slide Show view by clicking the Slide Show icon at the bottom of your screen and you should see Presenter View. Let me know in the comments if this helps you with your practicing. What happens when you press Windows key + X? Do you see the Windows Mobility Center? On the lower-left, choose Connect Display. Do you see the 4 options? I have been using power point presentations for training since last two decades but never came across such wonderful and trainer friendly tip. Great Idea !! I have Windows 7 but only one monitor and my computer does not seem to support more than one monitor. I was not able to change the setting from the control panel. But, I did use your tip (i.e., Windows + P) to select two monitors. I was still not able to put PowerPoint into Presenter View mode. This is kind of frustrating because I wouldn’t mind viewing the presentation in normal mode if only my hyperlinks would work in that mode. It’s a 247 slide presentation that I am reviewing and can’t seem to bookmark pages and make comments too. I tried this in the past (as you may recall) and just tried it again but my desktop still tells me I need 2 monitors. 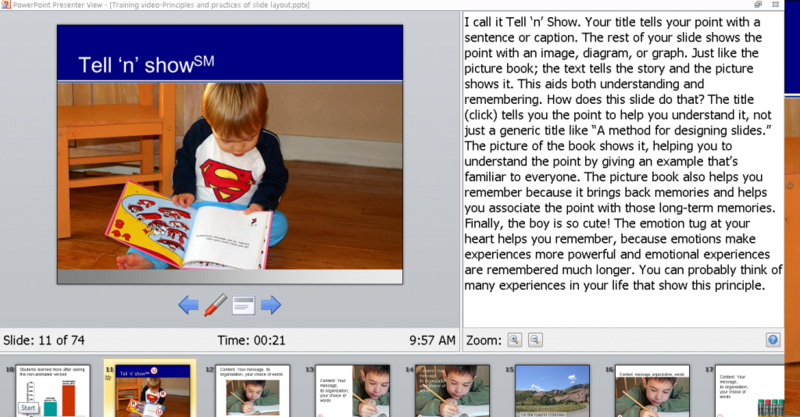 I would like to play a video clip (hyperlinked) in presenter view (for my work) as an instructor. When NOT IN PRESENTER VIEW I click on a box (that looks like a camera) on the PP slide then the video (which is linked) plays. When finished I close the video & see the PP automatically returning to the slide I was on prior to clicking the link. It would be great to do this in Presenter View. When I click on the hyperlink box the PP moves to the next slide, & does not play the hyperlinked movie clip. Please assist me (I believe we are running PP 2003 at work). Thank you so much for this Windows-P tip! I looked all over, and it is exactly what i want! Thanks!!! How do I get out of Slide Show Presenter? We run 2003 version of Power Point and use it for our scroll on a community tv channel. One of our volunteers accidently put us into the slide show presenter and we are unable to figure out how to get out of it. In Slide Show, Set Up Slideshow, uncheck the Use Presenter View check box. Is that what you mean? Thank you Ellen. I have already known about presenter view but the “win + P” tric will help me a lot. The size of notes section in Presenter View by default is too narrow for my purpose. For every presentation I open, I have to drag the line to increase the size of the notes section. Is there a setting that can increase the default size of the notes section? I am currently using Power Point 2010 on Windows 7. As far as I know, there’s no way to set the default size of the notes section in Presenter View. Was the question that David Thomas had on 17/7/2013 ever answered? I too have noted that in Presenter View, when I click on a hyperlink I have inserted, PPT moves to the next slide, and does not go to the hyperlinked document. I just tested a hyperlink on the first slide going to the third slide and it works in Presenter View. Sorry, maybe I should have been more clear. The hyperlinks work fine if one is a) not using a projector but rather using Presenter View with a PC and/or b) not hyperlinking to a document outside of PPT. If one does either, the hyperlink does not work. The only workaround I came up with is a) exit Presenter View b) click the hyperlink c) return to Presenter View. It slows one’s presentation down and is cumbersome. does this extended view work with Windows 10? I tried it but failed. Thanks for any help you might give me. @DorothyH, I totaly get what you are saying. I have exactly your issue. I have hyperlinks to videos outside of the slideshow. In presenter view, the vid plays on my laptop when I click the link, not on the projector. I too would like a solution! Thanks for the tips. Your ideas quickly solved a webinar recording problem. Kudos! Thank you so much for these tips…I’m already spreading them. I present within WebEx often and can’t seem to figure out how NOT to show my Presenter view to my audience…without ruining presenter view for myself. I’ve played around with the “Display Settings”, but this doesn’t help. Any thoughts? Glad my tips have helped! I’m not so familiar with WebEx, but you might ask their support. Usually, webinar services let you choose which monitor to display and if you have 2 monitors, you can display the slide show view but still have Presenter view on your other monitor. Also, in recent versions of PowerPoint, in Presenter View, you can choose Display Settings, Swap Presenter View and Slide Show view. You can also disable Presenter View. Go to Slide Show tab, Set Up Slide Show and uncheck the Use Presenter View check box. Does that help? I would like to know how to review the notes on the hidden ppt slides when using presentation view? The Slide is marked correctly hidden however the notes will not display and if you do click on the hidden slide it portrays the slide as if it was never hidden. I don’t really understand. In Presenter View, you don’t see the hidden slide, it goes from the previous slide to the following slide. If you go into Slide Show view from the hidden slide, you see the notes in Presenter view. Do you (or anyone else) know the shortcut to exit presenter view WITHOUT ending the slideshow? I.e., how do you just go back to regular presentation mode? This is really important if you need to click on a link on the slide or use an interactive module, like Poll Everywhere. I can’t seem to find an answer to this anywhere online. The best I can come up with is “Esc, then Shift-F5” but this becomes cumbersome when we have to switch back and forth all the time…Either way, thanks for this otherwise helpful article!